Earlier this month I had to opportunity to visit Paris during a series of meetings that were being held there. I had only been to Paris once before and that was only to change planes at the airport. This time I was there for four and a half days while I attended meetings in the mornings and evenings. That left the afternoons open for some sightseeing, which I don't always have much time to do. Paris is a very interesting and impressive city and there are so many amazing things there are to see in the city. Every city seems to have a certain kind of atmosphere all its own and Paris is no different. The hotel I stayed at was only about 20 minutes walking distance from the Eifel Tower. The picture here is one that I took while I was in Paris. From where I live here in Germany Paris is only an hour away by air so it is not too hard to get to. 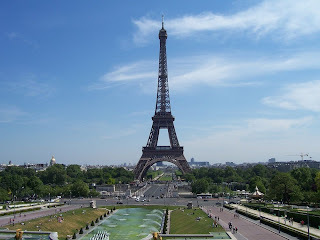 Next year there will be some more meetings in Paris during the month of May so if I am able to go to those meetings, and if I have some free time, I would definitely like to go and visit some more of the wonderful places in Paris. I took a lot of pictures while I was there and to end the blog here is another I took. 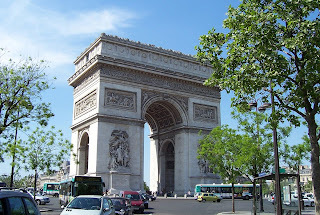 This is of course the Arch de Triumph; it too is quite impressive when you see it in person. these are some nice pics. glad to see you got to get away from the office a little. hopefully you can't get some more time for a little R&R.